Driving my 335i—and looking over the side of the road at the tops of trees—it was easy to imagine that I was on the very roof of the world. The absence of guardrails, and the toy-like appearance of farms and cows far below, only reinforced this impression. In reality, the elevations were only a fourth of so of the roads I’ve driven in the Alps, but the impression was no less vivid. West Virginia is still one of the most visually vertical places anywhere, and that implies that it also has some of the most interesting roads anywhere! My first attempt at this trip ended in frustration last December, with my summer performance Bridgestones scrabbling uselessly in the snow as I tried to negotiate a steep climb via switchback corners. There hadn’t been any snow predicted near my hometown or at my furthest destination—but I’d forgotten to check for the mountains in between. The Casselman Inn also catered to travelers on the National Road, starting in 1842. As many as 14 stagecoaches a day would stop here. On my December visit, it was snowing so hard that my camera had difficulty focusing. I continued on my snowy adventure, even as the roads got worse and the wind blew harder. From time to time, the skies would clear temporarily, such as in this photo of the headwaters of the Casselman River. From here, it runs northward for 56 miles before emptying into the mighty Youghiogheny at Confluence, PA. The wind in this open area was so strong that it nearly blew me into the fledgling river! The area wasn’t so flat and open just by coincidence. This is “Buckel’s Bog”: the site of the only known natural lake in all of Maryland. During the late Pleistocene Era (about 14,000 to 19,000 years ago), there was a shallow, 160-acre lake here. It’s long gone, obviously, and every current lake or reservoir in Maryland is man-made. Continuing to fight the snow, I willed the 335i on through a long series of descents and climbs, passing by Fort Henry, the Wisp ski resort, and a number of small towns. I doubted the wisdom of this adventure more and more as the BMW slid frequently and unexpectedly, even at slow speeds. Approaching a steep uphill section near Swallow Falls State Park, I realized that I was facing a dilemma: If I got a running start sufficient to make the climb, I’d never be able to negotiate the upcoming hairpin turn. And if I slowed enough for the curve, I wouldn’t be able to climb the grade. I chose the latter option, with predictable results. I threw in the towel, backed down the mountain, turned around, and (with considerable difficulty) retraced my steps back to civilization—in the form of plowed roads! Having been defeated in December, on the last day of February I returned to finished the remaining seven-eighths of my planned trip. This time the weather cooperated, although the skies rained on my just-washed 335i for roughly 100 miles. But it was worth it, since sights such as this one were everywhere. With my Blizzak snow tires safely in place, I was confident that I could tackle any snow along the way. Naturally I didn’t find any (but the tires still helped on several muddy sections). This time I easily zoomed up the mountain and around the switchbacks, arriving at a deserted Swallow Falls State Park by 10:45 AM. The virgin Hemlock and White Pine grove at the park is the last such stand in Maryland. Some of the trees are over 300 years old. I realized that I could be witnessing the same trees that Daniel Boone, Simon Kenton, and other frontiersman saw when they passed through this area on their way west. Hiking into the woods, I soon located the Youghiogheny River. Kayakers and exceptionally brave canoeists regard the Yough the same way that BMW drivers and riders view the Tail of the Dragon and the Nürburgring. And, as with these automobile venues, not everyone survives a trip down the Yough. Another short hike brought me to this view of upper Swallow Falls, on the Youghiogheny. And if there’s an upper falls, there’s bound to be a lower set as well, right? Between the rain, damp roads, and leftover road salt and cinders, my poor car was a mess. Fortunately, I later found a U-spray car wash in nearby Oakland, MD, and I was able to clear off the worst of the grime. I left Oakland and headed (finally) for West Virginia. Just before crossing the state line, however, this weathered space rocket appeared out of the shadows. Investigating further, I was able to open its hatch and peer inside. I marveled at NASA’s clever use of plywood as a structural element of the craft, but eventually I realized that this odd rocket was just an old amusement park ride. It looked like it would have been fun, even though there was no way to see out. Just across the West Virginia line, I went looking for what is claimed to be the smallest church in the continental U.S. I suspected that it might be hard to find… Our Lady of the Pines Catholic Church in Silver Lake, WV measures just 12 feet by 24 feet and was built in 1958 as a family memorial. Behind the church is (possibly) the country’s smallest post office. It handles outgoing mail every day, but counter service is available only on Fridays the Thirteenth. There was no question but that I was now in West Virginia! As luck would have it, the little church was open. Inside was a nice-looking altar, plus six two-person pews. In other words, just enough room for a minister and 12 disciples. The 335i was already beginning to pick up more spray from the road, and I contemplated washing it for the third time in less than 24 hours. However, I decided in favor of using it as The Ultimate Driving Machine, rather than The Ultimate Washing Machine, and pressed on toward Tunnelton. I hadn’t been on this section of Route 50 for a long time (see West Virginia (GPS, Gravel, and All)), and I thoroughly enjoyed pushing The Ultimate through the continuous series of bends, rises, and declines. In planning my trip, I figured that a town named Tunnelton probably had a tunnel. Approaching the village, I marveled again at how vertical West Virginia is. The Baltimore & Ohio Railroad used to run right through Tunnelton, and its modern-day successors still do. This was the old freight station, which was built in the early 1900s and continued in use through about 1980. The Tunnelton passenger station opened in 1913 and closed its doors in 1968, leading to a long period of deterioration. Thankfully, the local historical society came to its rescue, and the station has been renovated and is being converted to a museum. These days, Tunnelton’s population totals less than 300. The town thrived during the railroad and coal mining years, but, like the railroad station, it has deteriorated substantially. Its troubles began when the Bank of Tunnelton failed in 1928, shortly before the onset of the Great Depression. (Tunnelton continued its economic decline as the railroad and coal mining industries died out, and it has never recovered.) It appears that the bank was later used as a residence, but it was pretty hard to tell, owing to its trashed interior. I interviewed a 1% sample of the population—three teenagers sitting on a nearby porch—but they knew little about the bank’s history. My plan was to walk along the abandoned right of way for the old tracks, which I figured would parallel the active tracks all the way to the tunnel entrances. Moreover, it looked like an easy, safe hike of just a quarter mile or so. Before long, a couple of things became apparent: First, there were quite a number of fallen trees across the right of way. I’m reasonably agile for an old far … uh, I mean an old guy, and I managed to clamber over and under the trees as necessary. But second, all that rain from the prior day and night had run down the embankment and pooled in the right of way. My hike soon became an exercise in hopping from one little island of bamboo and underbrush to another, with the ratio of land to bog going down at an alarming rate. Oh, did I mention the hundreds of thorn bushes? At least sections of the trail were pretty—in kind of a dead and sodden way. My GPS data indicated that I started off at a brisk 3.5-mph pace, which soon slowed to about 2 mph, then down to 0.2 mph while clambering and scouting. Still, I apparently reached the tunnel entrance after only about 15 minutes. I swear, it seemed like an hour or more! But there it was, the old Kingwood Tunnel, built by the B&O as part of its massive effort to connect Baltimore with the Ohio River. At the time of its completion in 1852, it was the longest tunnel in the U.S. Two sets of tracks originally ran through here, but in 1865 the line was reduced to a single track to accommodate larger trains. The tunnel continued in use until the 1950s. A very interesting account of the engineering required to build the tunnel is available at Baltimore and Ohio Railroad: Kingwood Tunnel. Cave-ins were common during construction, and as many as 30 workers were killed and another 300 injured. The B&O’s chief engineer was Benjamin H. Latrobe, II, whose father had helped design and build the U.S. Capitol. When Labrobe realized that the Kingwood tunnel could not be completed in time for the line to be opened to the Ohio River, he designed a temporary series of switchback tracks. Trains would climb a grade that was nearly 5 times steeper than the industry standard of 116 feet per mile, then reverse onto the next section of track, climb that section, and pull forward again onto the next section. Labrobe wasn’t even sure that it would work, but it did. Early passengers were so terrified by this process that many of them preferred to disembark and walk over the mountain. The Kingwood tunnel and a portion of the temporary switchback system are shown in this early engraving. I wasn’t surprised to see that the abandoned tunnel entrance was closed off with large stone blocks, but I wasn’t expecting to see a person-sized hole knocked through the barrier. (With my usual macabre curiosity, I wondered whether the opening had been created by people outside, seeking to get into the blocked-off tunnel, or by someone or something inside, wishing to escape…) I really wanted to get a look inside, but every approach lay under a foot or more of water. My shoes and socks were already soaked and muddy, but my pants legs were still dry, so I didn’t just hop in. If I had waded in, then the resulting picture would have looked much like this one. In fact, this is my own photo of the inside of the 1852 Kingwood Tunnel. The old bricks lining the tunnel were holding up pretty well, but the entire 4,137-foot length appeared to be well under water. I got the above photo by powers of deduction, i.e., if a tunnel has an entrance, then it probably also has an exit. I merely hiked the quarter-mile swamp back to Tunnelton and then drove around to the west entrance, parked, and hiked the (surprisingly dry) four-tenths of a mile to that entrance. CSX had helpfully bulldozed a huge mound of dirt, rocks, and tree limbs into a pile blocking off the final approach to the old west entrance, but there was no stopping me now. As I climbed over the debris, I saw that there was also a hole knocked through the stone wall blocking this entrance, with a little 6-inch-wide outcropping available to balance on while holding the camera one-handed through the opening. Anyway, if you’re going to visit the Kingwood Tunnel, definitely go for the west entrance. There’s even an abandoned B&O control tower along the way. You almost never see these anymore. Grafton was, and still is, a major railroading town. The second building from the right is the former B&O passenger station, with the 6½-story Willard Hotel next to it. Both were built in 1911 and have been vacant for many years, although the station has benefited from some renovations. (Postcard of opening day courtesy of A History of Grafton. This building in Grafton seems to have featured almost every sort of advertisement possible. Remember the rare old railroad control tower near the Kingwood Tunnel? Well, Grafton still has one, too. In all my traveling, I hadn’t seen a single one; now I’d found two within the space of 90 minutes! 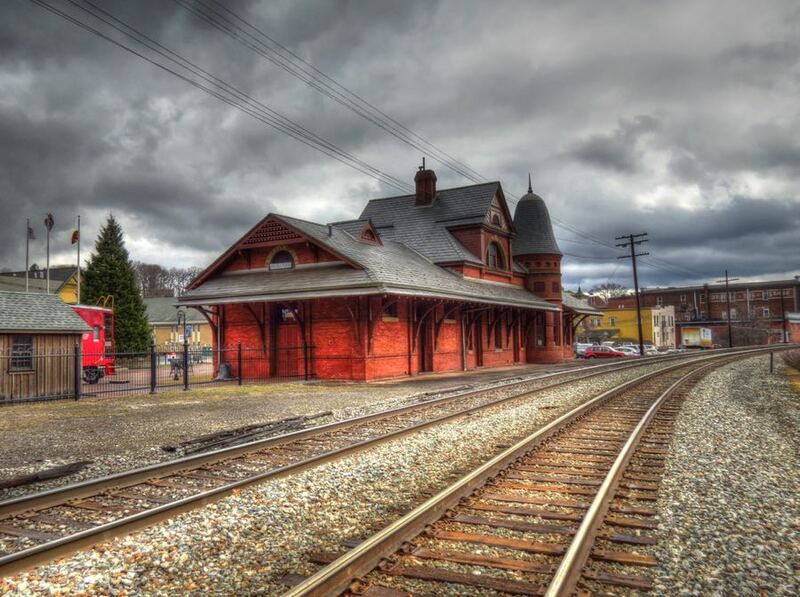 Speaking of rare, you don’t see many railroad roundhouses anymore—but there’s one in Grafton. The “house” part is long gone, sadly, but the pit and turntable can be seen in this photo. With the shadows lengthening by the minute, I returned to Route 50 and made haste for Clarksburg—only to arrive in the middle of evening rush hour. I dove off the busy highway and into the heart of the downtown area, where the traffic was thankfully much less dense. Job and Jerviah Goff moved to this area in 1804, along with their 8 children, one of whom was Waldo P. Goff (1796-1881). Waldo and his wife Harriet Moore built this beautiful Neo-Classical brick mansion in 1839, and their daughter May named it Waldomore after her parents’ names. The Goff family and their descendants lived here for 92 years, when May left it to the city of Clarksburg for use as a public library. Lots of churches have adjoining cemeteries—but in the case of the Oak Mound Evangelical Church in Clarksburg, the cemetery is a 2,000-year-old Indian burial mound. Archaeologists in 1969 found the remains of two individuals (probably members of the early Hopewell culture), along with a number of flint tools and pottery shards. I had one more destination before heading to my overnight stop in New Martinsville, WV on the Ohio River. You all know the meaning of “reintarnation,” right? That is, after you die you come back to life as a hillbilly? Well, if that’s what reintarnation means, then what does “Flinderation” mean? I was determined to find out. In the meantime, I began using Flinderation! as an expression of surprise, annoyance, or general bemusement. It seemed like an appropriate West Virginia exclamation. As it turned out, Flinderation is a both a place and an expression. The expression means “a state of being in flinders” (i.e., fragments). The place is a very small town west of Clarksburg, one that happens to be the location of the 1857 Flinderation railroad tunnel—considered one of the most haunted spots in West Virginia. All the ghost stories refer to a train roaring into the 1,086-foot tunnel while a repair crew was inside fixing the tracks. The resulting derailment killed either 1, 2, or 3 of the workers, and the tunnel has been a source of eerie lights, strange moaning sounds, loud crashing noises, whispers of “Help me!” and assorted other phenomena ever since. After a long day of touring, and absent any more daylight for photos, I was anxious to get to New Martinsville for some dinner and rest. My scheduled route would have taken me up Route 20, but I opted for the equally curvy Route 18, which was a little quicker. It would have been a fabulous driving opportunity, but its patched and broken pavement made for a long, rough ride. Next time I’ll stick to Route 20. It had been a terrific day, full of exciting West Virginia roads, historical hiking, and wonderful sights. After a quick dinner, a call to my very patient wife Nancy, and a brief review of the next day’s route, it was lights out. Safely back in West Virginia, I drove in search of historical sites in New Martinsville. The first non-Native-American to live in this area was Edward Doolin, who settled here in about 1780. In 1782, as he went out the door of his cabin, a party of Delaware Indians promptly shot and scalped him. They left him dead in his doorway—but allowed Doolin’s wife and newborn daughter to remain in their bed, untouched, owing to her delicate condition. They promised to return in a few days and take her to marry their Chief, but she opted to flee as soon as they left. Their baby, Sarah, grew up and married Daniel Boone, a descendant of the well-known frontiersman of the same name. From 1840 through the early 1900s, the New Martinsville Wharf was the focal point of nearly all economic and social activity in the city. All of the steamboats and other river traffic landed here, at a stationary “wharf boat,” and hotels were built on the riverbank to accommodate merchants and other travelers. In 1925, actress Gloria Swanson arrived in New Martinsville to film the silent movie Stage Struck, which was set on a showboat. The entire town turned out to see the star and watch the filming, and the town’s postmaster even managed to fall into the river while trying to get a glimpse of her. Today there are fews signs of the bustling activity that once took place at the Wharf—just the cobblestones and the large stone walls lining the river bank. Ms. Swanson and countless other visitors would have walked by the magnificent Wetzel County Courthouse at the top of the embankment next to the Wharf. The courthouse was built in 1901, replacing an earlier one from 1852, and it remains a most impressive sight. Levi Morgan was there, skinning a wolf, which he had just taken from a trap. He quickly seized his gun and sprang behind a large boulder, the Indians taking shelter behind trees as soon as he was from their view. He found that the Indians were looking for him at the other end of the rock, and seeing one peep out, immediately pulled his gun and fired, on which the Indian fell dead. But on turning to reload his gun, found that he had left his powder horn where he was skinning the wolf. He then darted from behind the rock with all of his speed, and one of the savages took after him. The Indian, thinking that he was calling upon some one on the other side of the hill, immediately beat a hasty retreat. Morgan then turned and went home, being pleased with his success, leaving his gun, shot pouch and coat to reward the savage for the deception practiced upon him. At the treaty of Auglaize [in 1795], Morgan met the Indian who had given him such a chase, and he still had the gun that Morgan had thrown down. After talking over the circumstance, they decided to test the ownership of it by a friendly race. The Indian being beaten, rubbed his hands and said: “Stiff, stiff; too old, too old.” “Well,” said Morgan, “you got the gun by outrunning me then, and I should have it for outrunning you now,” and accordingly took it. Like so many West Virginia towns, New Martinsville prospered during the heyday of river travel, railroads, and coal mining. This massive brick building was the office and warehouse facility for the New Martinsville Grocery Company starting in 1900. Here, I’ve parked immediately facing the spot where the B&O passenger station once stood. The former Cottage Hotel still stands in the background. (It now serves as the M&K Bar.) If you look carefully at the historical photo, you’ll see part of the Cottage behind the station. The hotel was built in 1890, in the “Shingle” style—a new one for me. On yet another mountaintop, the Limestone United Methodist Church has stood proudly since 1856. Its bell tower apparently succumbed to some disaster, but the handsome bell is still on hand. I’ve never understood how people are able to farm in West Virginia, where the fields and pastures are so far from horizontal. But somehow they do. As might be expected, not all of these farms have survived. Whenever I see a place like this, I wonder whether it represents the ruins of someone’s hopes and dreams—or the liberation of someone else to pursue their goals in a more viable occupation. I’d noticed several signs along Amos Hollow Road indicating that it was not suitable for large trucks or trucks with trailers. Imagine my surprise, then, when I crested a hill and discovered not just a parked tractor-trailer blocking much of the road, but a wide load tractor-trailer! How it managed to get here is beyond me. There was enough room to squeeze by on the left, except for the pair of large dump trucks parked on that side. It turned out that the wide load driver had delivered a mammoth earthmover, which was performing road repairs further on (and blocking the road there, as well). Eventually, the earthmover went off-road, the wide load headed for home, and I was able to continue. Along with small farms in impossible places, West Virginia is blessed with many small churches in the middle of nowhere. Despite the absence of any communities nearby, these houses of worship seem to be doing just fine. The day had warmed up nicely, and it was time to put the top down and enjoy the Spring-like weather. This is the West Virginia Fork Fish Creek. Not far from here it joins the Pennsylvania Fork Fish Creek to form just plain old Fish Creek. The vertical nature of West Virginia presents many problems for residents. Entering Cameron, I marveled at these steps leading up to the house above. As best I could tell, it’s the only way to get there. In 1788, three brothers—Joseph, Christopher, and John Himes—became the first settlers in what is now Cameron, WV. They built a blockhouse for protection from Indian raids, but, at their first encounter, the settlers and Native Americans shared a feast and lived in harmony thereafter. The settlement remained very small until the arrival of the B&O Railroad line in 1852, after which it expanded rapidly. The Methodist Church (at left in this photo) was only a year old when the fire broke out. Situated on the other side of Grave Creek, it survived the fire. The Presbyterian Church (next to the 335i) was built in 1907. Both edifices are striking, and it’s interesting to note the differences in their towers between the current and historical photos. This brick building was the original B&O passenger station in 1878. It served as a freight station after a much larger passenger facility was built, which served 10 passenger trains a day. The “Curved Building” was my favorite. The B&O tracks used to run immediately alongside this building, with a hardware store on the other side of the tracks. The old photo shows one of the upstairs rooms. There are “Flatiron” buildings dotted all across the U.S., so-named because of their distinctive wedge shapes. This one started life as the First Citizens Bank (first floor) and Parriot Hotel (upper stories) in 1896. See the cylindrical section that juts out into the center of the pool? That was an innovative “safety station,” where lifeguards could look through underwater windows and ensure that divers and swimmers were okay. It was probably a good idea, since prior to 1992 the pool had a high diving board, and the depth of the water is only 8½ feet. The pool deteriorated and was closed in 2008—but the town launched a rehabilitation project followed by a grand reopening in 2013. Oh, and the water in the pool provides an emergency, 235,000-gallon reserve in case there’s ever another catastrophic fire in Cameron. I detoured off of 250 in search of the B&O Board Tree Tunnel, but I wasn’t able to locate it. I did find Georgetown, WV, which is about 50 feet from the Pennsylvania state line and has a population close to zero. I also found yet another example of “how people get to their houses in West Virginia.” There are many little bridges allowing residents to get from the road on one side of a creek to their house on the other side. Side trips like these always turn up other interesting sights, such as this abandoned home. Most such places are largely gutted and empty inside, but this one still had most of its furnishings. They didn’t amount to much, so even in impoverished West Virginia it must have been too much trouble to cart any of it away. I couldn’t help noticing that many of the graves were for Irish immigrants and their families, with the headstones usually listing the individuals’ hometowns. As it happens, the Irish Potato Famine of 1845-1852 drove many families to the U.S., and roughly 5,000 Irishmen were employed building the B&O Railroad. The powerful Pennsylvania Railroad had successfully lobbied the PA legislature to prevent its competitor from laying their tracks anywhere in the state, so the B&O had to select a fairly tortuous path through West Virginia that bypassed—barely—Pennsylvania. The Board Tree tunnel was part of this route, and it’s possible that many of the Irish workers and their families settled in this area. In vain we mourn for thee. Other records indicate that she moved here with her parents and was married in 1860, which would mean she was either 15 or 16 at the time. Catharine’s husband, Michael, is not buried here, which suggests that he did not stay in the area. William Little and his wife, whose name has been lost to history, moved to what became Littleton in the early 1800s. It was a complete wilderness, without another person for miles, and the town of Littleton didn’t begin to grow until the railroad came through in about 1853. Oil was discovered in 1896, further fueling the town’s growth. By the early 1900s, there were four hotels (each with a saloon, naturally), two banks, several churches, a school, a mill, and a number of stores and other businesses. Then everything started going wrong. Over half the town was destroyed by fire in 1906, and the Depression hit in the late 1920s. Railroad passenger service stopped in 1950 and freight service 10 years later. Today, Littleton is well on its way to becoming a ghost town. As I drove into town on Highway 250, I immediately got a bad feeling. Call it “actuary’s intuition” or whatever, I just did not feel comfortable. I’ve been through many impoverished places and deserted areas without missing a beat, but something was different here. It probably didn’t help that, as I stopped in front of the Exchange Bank, an unseen voice called out, “Nice convertible… a—hole.” Only later did I learn that Littleton is the poorest town in all of West Virginia (which itself is the second-poorest state in the country) or that there is an epidemic of heroin and other drug use here. There have been two triple-homicides in recent years, which is a lot given that the town’s population is well under 200. Littleton was definitely not living up to its postcard reputation. The Exchange Bank next door has fared a bit better, in that its walls are still standing, along with some of its floors. The Exchange’s history was similar to the Bank of Littleton’s, although I believe the Exchange building was eventually repurposed as Littleton’s community center. It was destroyed by vandalism and fire a few years ago. I drove up Old School House Road in Littleton to see if there might be an old school there. It was a typical West Virginia hillside road, with houses on the downhill side and a church and more houses in the uphill direction. And what was left of the old school, as it turned out. After the 1906 fire, Littleton replaced all its wooden buildings with ones made of bricks. In a town as tough as this one, even that wasn’t enough. Remember the Board Tree Cemetery? Well, after the railroad construction was completed, Board Tree’s population declined precipitously, and the mostly Irish-Catholic residents relocated to Littleton, where they built a new church in 1870. (There were plans to move the cemetery as well, but they were never acted on.) Our Lady of the Assumption Catholic Church is still standing, but it has not held services since 1995. Following a Christmas pageant on December 23, 1896, the church’s parishioners were crossing a wire-suspension bridge over Fish Creek on their way back to town. Tragically, the bridge collapsed, sending about 40 of the people into the rock-strewn water below. Several died, and many more were seriously injured. The steel replacement bridge from 1897 is still in place but is now (wisely) closed to traffic. The town of Hundred has a lot of history in its own right, but I was primarily interested in finding the graves of Henry and Hannah. Climbing yet another steep hill, I searched the cemetery behind the United Methodist Church for some time before I found them. They were given a new headstone in 1972 by one of their many descendants. This is the sole remaining covered bridge in Wetzel County. It was built across Fish creek in 1881 and has been in use ever since. Just in case any staunch Baptists are reading this report, here’s the Harmony Baptist Church near Burton, WV. It was built in the early 1850s and recently reopened for services—minus one steeple but with the addition of a rudimentary elevator. And while I’m at it, here’s the handsome Blacksville Baptist Church. It’s so close to the Mason-Dixon Line that if the congregation all sneezed simultaneously, they’d be in Pennsylvania. Once in a while—well actually, all the time—I get intrigued by an old photo and wonder where it was taken and whether the setting is still the same. In this instance, I knew that this photo of a covered bridge and two hillside churches was taken somewhere near Wadestown, WV. With the help of some local folks, one of whom wanted to trade me a riding lawnmower for my 335i, I found the spot. The covered bridge has been replaced with a modern one, and both churches are gone. The older view had a lot more going for it. On the other hand, the Wadestown Cemetery is still alive and well on top of the hill. Okay, not exactly alive, but you know what I mean. With mechanized coal loading and electric coal trolleys replacing manual loading and mules, production capabilities ramped up so quickly that the industry was overproducing even before the Great Depression struck. By 1932, thousands of miners were out of work, many were incapacitated and no longer had health care, and the entire area was destitute. Scotts Run became the most visible face of the Depression in the U.S.
Back in Scotts Run, an extraordinary young woman named Mary Behner started assistance efforts through “The Shack,” which offered counseling, food, and many other services to residents. (My friends would never forgive me if I failed to note that Ms. Behner was a graduate of our alma mater, the College of Wooster.) Excerpts from Mary Behner’s diary document the horrible conditions in Scotts Run and her efforts to help the area’s families. Her original Shack is long gone, but its replacement is still operating on Route 19, only 200 feet from the modern traffic flow bustling up and down Interstate 79. A Methodist church in Morgantown also stepped in to help support the families of unemployed miners. The church established the Scotts Run Settlement House in 1922—and it is still providing shelter and other assistance to needy families. Although the Scotts Run coal mines closed many years ago, there are still remnants of the industry. The ruins are an eyesore, but they serve as a reminder of what can go wrong as the nation’s economy changes. The contrast between Scotts Run and neighboring Morgantown, which is generally prospering on the other side of the Monongahela River, couldn’t be more obvious. The challenge continues to be how to transition workers with few or outmoded skills into workers with the abilities needed by today’s economy. That Scotts Run has not managed this transition even 80-plus years after the collapse of the coal industry speaks volumes about the magnitude of the challenge—and what works and what doesn’t. With thoughts in mind of poverty, crime, drugs, and the other mighty problems facing much of West Virginia, I went in search of some prehistoric comfort—namely, the Hamilton Farm Native American petroglyphs. The exact location of these carved line drawings is a bit of a secret, so I wasn’t sure whether I could find them. Nonetheless, I pressed on, fighting rush hour traffic leaving Morgantown and arriving where I thought the site might be located. Many cultures around the world practiced this art, including, in this instance, the Late Prehistoric Monongahela or Fort Ancient Indians in West Virginia (1000-1750 AD). I found a large, flat, sandstone rock right where I expected it to be, and it appeared to fit the description I’d read of the site. And almost immediately I spotted this depiction of an arrow. As I looked around for other petroglyphs, however, I couldn’t see any of the symbols sketched by J. Sutton Wall in 1884. Moreover, I was pretty sure that I saw a lightly carved signature of “Jimmy.” In retrospect, I think I found the right place, but I also believe that the actual Indian petroglyphs have been purposely covered up by soil. Oh well—I’ll still count the arrow, even if it’s not shown on Mr. Wall’s drawing. It was now time to relax, grab some portable dinner, and point the 335i in the direction of Catonsville, MD, about 200 miles away. I enjoyed every moment of this tour, even Littleton, and I gained a new respect for what our pioneer, farmer, and coal-mining ancestors faced over the last 300 years. West Virginia is both beautiful and fascinating, and I can’t wait to return. PS: Here is a high-level look at my route for this trip, and a squigglier one would be hard to imagine! Thank you! My mom was Mary Behner! I donated her Shack diaries to the state after she died in 1988. The Shack work recently celebrated its 90th year. We have a state marker at the original site of The Shack. Arthurdale was micromanaged by Congress. Wow, that’s fascinating—your Mom left quite a legacy in the area, one to be very proud of! She helped a great many people, both directly through her own efforts and then subsequently as the Shack continued its operations. I found the historical marker you mentioned, although I couldn’t figure out exactly where the original Shack was. The marker says 50 feet north of the sign. They couldn’t put the marker right on the site because of some water line. Ah, thanks for the clarification on where the original Shack was located. I was trying to figure out its location based on historical photos (when there were railroad tracks, other buildings, etc.) relative to today’s roads and terrain. I tried but failed! It would have helped if I’d read the marker more carefully! PS: Did you go to the College of Wooster like your Mom? My wife and I loved it there.